Midwest UX 2016 will be held in Louisville’s South Fourth district. Once the home of Louisville’s most popular and active retail center, the area is currently undergoing revitalization to return it to a shopping and entertainment destination in the heart of the city. Casually referred to as “SoFo”, this area is within easy walking distance to many hotels, restaurants, and tourist attractions in downtown Louisville. When The Louisville Palace originally opened in 1928 as a first-run movie theater, it was described as “an architectural marvel”. 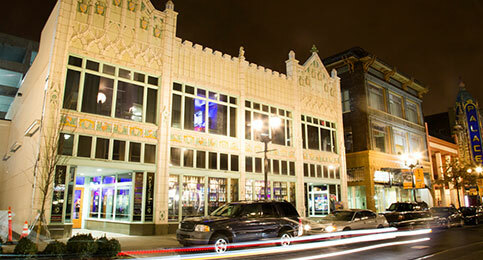 After decades of operation as a cinema, the theater underwent a multi-million dollar restoration in the early 90’s to become one of Louisville’s premier event venues, hosting national musical acts, touring Broadway plays, classic film series, and more. The beautiful Spanish baroque style of this theater is an experience unto itself, and will be an enchanting setting for this year’s conference. Check out an awesome, 3D experience of The Palace made by Kitestring. 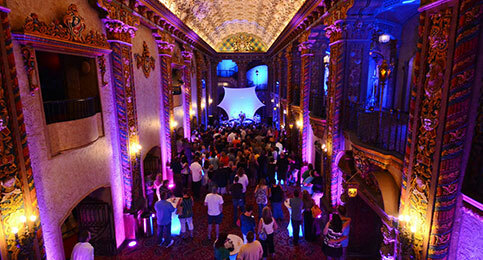 Just steps up Fourth Street from The Louisville Palace lies the Mercury Ballroom, a beautiful example of Tudor-Gothic architecture that sat vacant for three decades before recently being renovated and given new life as a concert venue. The building, clad in glazed architectural terra cotta, is known as the Wright-Taylor Building, originally home to the offices of Wright & Taylor, Inc., distributors of Old Charter Bourbon Whiskey. 8up elevated drinkery & kitchen, a dazzling outdoor + indoor all glass drinking and eating experience, offers the best in unparalleled views. whether lounging al fresco or enjoying the dining room, 8up offers a myriad of drinking and dining experiences designed to please the sophisticated palates and celebrate the spirit of fun that defines louisville. Experience the lounge at 8up that boasts its very own kitchen designated to the indoor bar and enjoy our open air rooftop bar complete with fire pits and plenty of seating overlooking louisville. It started way back when the young Mary O’Shea moved to Chicago in 1923, leaving her large family’s farm life behind for the big city and finding her true calling in hospitality. She would bring that enthusiasm and experience to Louisville in 1958 and open Mary’s Chateau. It was the beginning of a 4 generation family business focused on providing great cheer to all they served. Midwest UX sponsorships provide companies with an opportunity to connect with professionals involved with user experience, interaction design, and information architecture.